In its report The Future of the Public’s Health in the 21st Century, the Institute of Medicine (IOM) calls for significant movement in “building a new generation of intersectoral partnerships that draw on the perspectives and resources of diverse communities and actively engage them in health action” (IOM, 2002). Although public health programs and services were traditionally delivered mainly by governmental health departments, today we see public health services and programs delivered by other governmental agencies, health care institutions, community-based organizations, and the other private sector organizations. With health care reform, the large share of the U.S. gross domestic product going toward health care, and the need to get greater value from the health care dollar, there is a growing recognition that the health care and public health sectors in individual communities and across the nation must work to align their efforts to improve health outcomes. The phrase “population health” is increasingly used by researchers, practitioners, and policy makers in health care, public health, and other fields. Although their understanding of this phrase differs, many see attention to population health as a potent opportunity for health care delivery systems, public health agencies, community-based organizations, and many other entities to work together to improve health outcomes in the communities they serve (Stoto, 2013). Public health and health care organizations are more effective when they combine their efforts to address a community population health issue than when they work separately and competitively. Recently, the Public Health Foundation (PHF) developed and began testing a population health driver diagram framework that can be used to tackle challenges at the crossroads of the public health and health care sectors. Through initial piloting, the PHF has been demonstrating the value of the population health driver diagram for aligning efforts of public health and health care organizations that focus on improving the health of a community. This framework relies on public health and health care to work collaboratively rather than competitively, offering far-reaching potential for both the sectors and the communities they serve. prevent and treat disease, control health care costs, and promote health in our communities. What is a Population Health Driver Diagram? A population health driver diagram identifies primary and secondary drivers of an identified community health objective and serves as a framework for determining and aligning actions that can be taken within a community for achieving the objective. This framework offers not only a starting point for discussion but also flexibility for identifying and addressing unique community characteristics, assets, and needs. It helps create an atmosphere of cooperation by enabling each participant working to address the specific community health objective the opportunity to identify and articulate roles already being played by that individual’s organization and to develop an understanding of how what he or she is doing fits in with other community organizations. In addition, this framework can be used to determine other actions that can be taken individually and collectively to positively impact the particular community health objective. In 2012, the PHF led the development of a public health driver diagram to address a challenge being faced by both the public health and health care communities—the need to improve the use of antibiotics. The Public Health Antibiotic Stewardship Driver Diagram (Figure 1) was designed to achieve optimal antibiotic use by identifying primary and secondary drivers that both the public health and health care communities can collectively address. This public health driver diagram complements a similar hospital-based Antibiotic Stewardship Driver Diagram (See http://www.cdc.gov/getsmart/healthcare/pdfs/Antibiotic_Stewardship_Driver_Diagram.pdf.) developed by the Institute for Healthcare Improvement and can be used as a companion to the hospital-based driver diagram to further foster interdisciplinary collaboration as a strategy for effectively addressing this specific community health challenge. Using the health issue of increasing optimal antibiotic use as an initial testing ground for a public health driver diagram, workers piloted the Public Health Antibiotic Stewardship Driver Diagram in three locations—Independence, Missouri, and the states of Connecticut and Maine. Three health departments in these jurisdictions—the Independence Health Department, the Connecticut Department of Public Health, and the Maine Centers for Disease Control—collaborated with their partners in health care to test the driver diagram framework and determine its effectiveness for identifying intervention points for antibiotic stewardship and taking collective action within their communities. Each site approached the challenge differently, but together these pilot sites addressed all the identified public health primary drivers of optimal antibiotic use—appropriate use of antibiotics, data monitoring and stewardship infrastructure, and knowledge and awareness of the importance of appropriate antibiotic use. Each pilot developed and implemented interventions to improve the use of antibiotics on the basis of the drivers it was addressing. Although the specific accomplishments of each site differed, implementation of protocols to tackle antibiotic use and the spread of antibiotic-resistant disease, as well as the education of physicians, nurses, pharmacists, child care workers, and others about the appropriate and inappropriate use of antibiotics, were pillars of achievement common among the pilots. The Independence Health Department worked with local child care facilities to implement protocols for improved antibiotic use that targeted parents. They also partnered with the Centerpoint Medical Center to develop a pocket guide about prescribing antibiotics to improve the prescribing habits of physicians. The Maine Centers for Disease Control and its long-term care (LTC) facility partners addressed drivers to prevent antibiotic-resistant diseases, such as increasing hand hygiene compliance protocols and using tracer kits to assess cleaning efficacy in LTC facilities. The Connecticut Department of Public Health and LTC facilities worked collaboratively to create a “best practices checklist” to simplify implementation of practices and protocols for tracking and treating antibiotic-resistant infections and improving the way antibiotics were being used within LTCs. The Public Health Antibiotic Stewardship Driver Diagram was used as a guide for selecting points of intervention. Quality improvement tools and methods were used to develop and implement protocols, procedures, or tools to address drivers for optimal antibiotic use. Each health department functioned as a resource to its health care partners, helping them to meet regulatory requirements and address fiscal needs, convening and facilitating productive discussions, and communicating about joint activities. In 2014, the framework was used for developing the Population Health Driver Diagram to Increase Use of Oral Health Care. (See www.phf.org/resourcestools/Pages/Population_Health_Driver_Diagram_to_Increase_Use_of_Oral_Health_Care_Services.aspx (accessed February 2, 2015).) The next step is to pilot this driver diagram in several communities. In addition, population health driver diagrams are being developed and tested to address vector control improvement and diabetes risk reduction. As the health care sector has become increasingly engaged in developing and using this framework, the term “public health” has been replaced with the term “population health.” The rationale for this change is that many health care professionals engaged in these initiatives thought that the term “public health” indicated that the community health challenge being discussed was a problem to be addressed primarily by governmental public health. Aligning efforts to address a community health challenge is far more effective and efficient than having the public health and health care sectors working separately and competitively. The population health driver diagram framework is one approach that holds promise for reducing the potential competitive nature of relationships among public health, health care, and other organizations in a community and creating a more collaborative environment where collective action is taken to improve the health of a community. Centers for Medicare and Medicaid Services. 2015. National health expenditures 2013 highlights. http://www.cms.gov/Research-Statistics-Data-and-Systems/Statistics-Trends andReports/NationalHealthExpendData/Downloads/highlights.pdf (accessed January 10, 2015). IOM (Institute of Medicine). 2002. The future of the public’s health in the 21st century. Washington, DC: The National Academies Press. Public Health Foundation. 2013. 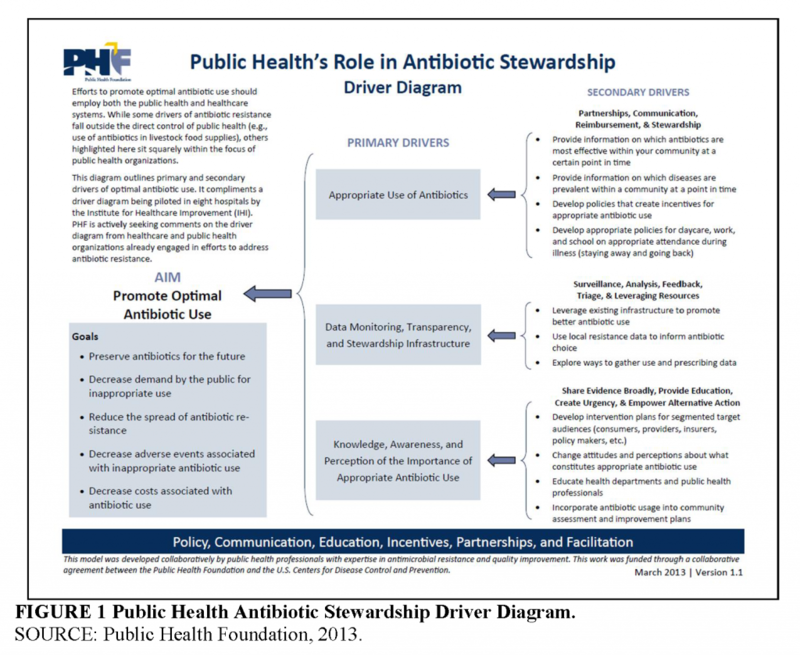 Public Health’s Role in Antibiotic Stewardship – Driver Diagram. http://www.phf.org/resourcestools/Documents/Antibiotic_Stewardship_Driver_Diagram.pdf (accessed February 2, 2015). Stoto, M. 2013. Population health in the Affordable Care Act era. Washington, DC: AcademyHealth. The views expressed in this discussion paper are those of the authors and not necessarily of the authors’ organization or of the Institute of Medicine. The paper is intended to help inform and stimulate discussion. It has not been subjected to the review procedures of the Institute of Medicine and is not a report of the Institute of Medicine or of the National Research Council.